Cosmic trailblazer SpaceX successfully launched and landed its Falcon 9 rocket and three Elon Musk fans had a dazzling view of take-off – watching it from 8,500ft above ground. 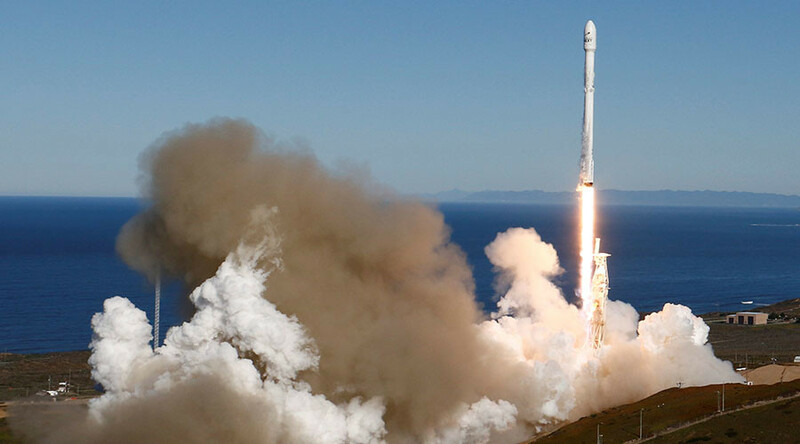 The rocket delivered its cargo of 10 communication satellites into orbit on Saturday following a failed attempt which resulted in a disastrous explosion in August, setting back the launch by four months. The rocket lifted off from Vandenberg Air Force base in California but, not satisfied with watching the spectacle from the sidelines, a trio of SpaceX enthusiasts took to the skies, while observing a strictly-enforced no-fly zone, to get a better view from a height of around 8,500ft (2591 meters). The three friends, Amir Blachman, Ben Marcus and Van Espahbodi, took off from Santa Monica airport on the morning of the launch, and 40 minutes later were in position to shoot their awesome footage. The three men are space pioneers in their own right with each involved in different aspects of space exploration, from funding to private space station design.